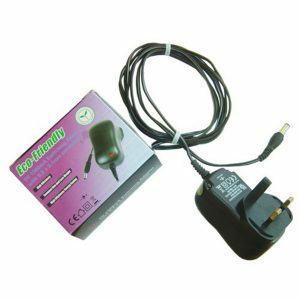 This PinPod UK 3 pin external power supply (10 metre) is a useful accessory for both main models of the PinPod outdoor secure parcel delivery box system. Batteries perform sub optimally in extremes of cold and eventually depending on how frequently you use your PinPod they will go flat. They aren’t cheap and they’re not very environmentally friendly either. You can run your PINPOD using this handy PinPod UK 3 pin external power supply (10 metre) instead of batteries. This plug in mains power supply unit (PSU) is designed for 3 pin UK mains sockets and provides 6 volt DC output to power your Pinpod. Fitted with a 10 metre cable, this external power supply will charge your PinPod rapidly. There is a hole at the front of your PinPod through which the cable can be inserted and plugged into the socket on the inside. Both optional mounting poles have holes to allow the PSU to be used.